Did you know that Big Sky is a world class fly fishing destination? 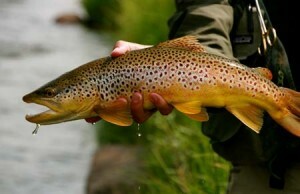 People from all over the world head to the legendary rivers, streams, and lakes of Big Sky country to go fly fishing. This mountain paradise is every fly fisher's dream. You might even recognize some of Big Sky's fly fishing hotspots from the Hollywood hit, "A River Runs Through It." Big Sky is surrounded by blue ribbon waters. There are hundreds of miles of trout water within an hour drive of Big Sky. 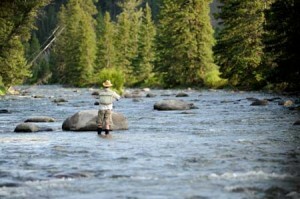 Come and fish the Gallatin, Madison, Yellowstone, or other nearby rivers. Get off the beaten path and cast a fly on mountain streams or pristine alpine lakes in the Gallatin National Forest. Head into Yellowstone National Park and fish in one of the world's most scenic locations. The fly fishing around here is endless. No matter what experience level you are, be sure to stop by one of Big Sky's fly fishing shops or guide services to learn about Montana and Yellowstone National Park fishing licenses, discover water access points, discuss fly recommendations, or book a fly fishing guide. 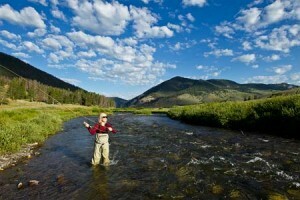 Big Sky is home to some of the best fly fishing guides in the world. These licensed fly fishing guides are happy to show you what fly fishing in Big Sky is all about. Hire a guide and learn how to tie knots, improve your casting, or pick the best flies. These professional fly fishing guides will even show you the best waters around and help you have a memorable fishing experience in Big Sky. Fly fishing in Big Sky is a life changing experience. As they say, "A bad day of fishing is better than a good day of work." FYI - Did you know that you can you fly fish in Big Sky year round? Stop by one of the shops or guide services to learn more about fly fishing in Big Sky and to set up your fly fishing adventure.